You are viewing the archived Multivitamins rating page. Follow the link to view the current Multivitamin rating page. Compare multivitamins in New Zealand at Canstar Blue. Thompson’s, Blackmores, Centrum, Clinicians, GO Healthy, Healtheries, Natures Own, Nutralife, Red Seal, Swisse are rated for value for money, ease of consumption, effectiveness, taste, availability and overall satisfaction. Supplying vitamins and supplements in New Zealand since 1951, today Thompson’s prides itself on offering a natural approach to healthcare. Just as you need to keep your car topped up with fuel, oil and water, we need to keep our bodies topped up with a number of vitamins and minerals that for some of us aren’t as prevalent in our diet as we would like. The regular, and ongoing, debate around the need and effectiveness of vitamin supplements is well documented. But, despite the views from what sometimes feels like an infinite number of professionals and experts, it seems people are still willing to make up their own mind. Our recent survey (published May 2017) of over 1,100 New Zealanders found that 46% of people who took multivitamins in one form or another felt all the better for it. A further 25% of people were unsure of the benefits but liked taking them anyway. With so many products and brands available, trying to find the one for you can be a daunting and time consuming task, so that’s why Canstar Blue has done some of the work for you. Our survey is not meant to be a substitute for medical advice – it’s always best to speak to a medical professional for that – what we want to do is give you a bit of insight into what people like about the multivitamins they use. Effectiveness came out on top, followed by value for money, taste, ease of consumption and finally availability. 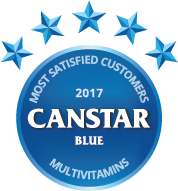 Canstar Blue commissioned I-view to survey 2,500 New Zealand consumers across a range of categories to measure and track customer satisfaction. The outcomes reported are the results from customers who have purchased and consumed multivitamins in the last 12 months – in this case, 1,103 New Zealanders.